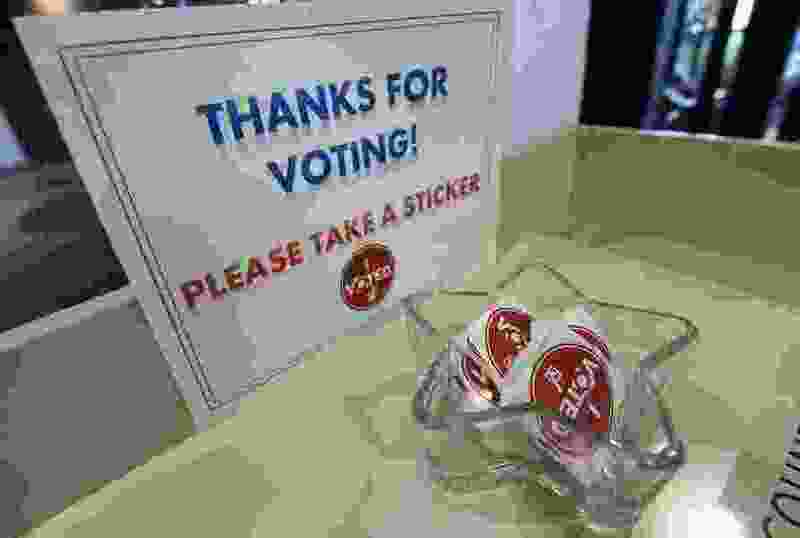 (Francisco Kjolseth | The Salt Lake Tribune) 'I Voted' sticker are available to people who vote at the Salt Lake County complex during primary election day on Tuesday, June 26, 2018. Members of The Salt Lake Tribune Editorial Board have spoken to the candidates, heard from the advocates and considered the issues. These are the conclusions we have come to — in a process that is entirely separate from the newsroom — and as expressed in this space over the last several days. Now — unless you have already filled out you mail-in ballot or dropped by an early voting spot — it is your turn. Whether you agree with us or not, please vote. The political veteran stands to walk into the Senate with the expertise and gravitas that body needs to get past years of gridlock and deal with crucial issues from immigration to health care. The standard-bearer of the new United Utah Party would be an energetic and bridge-building alternative to the long-time incumbent, Republican Rob Bishop. A newcomer who started out as a single-issue (health care) candidate has shown herself to be a caring and independent alternative to an incumbent, Chris Stewart, who spends far too much time and energy carrying water for an administration that doesn’t deserve it. A Native American and academic who sees the value in the preservation of public lands, as well as the need for humane immigration policies and health care reform that leaves no one behind has the advantage over short-term incumbent John Curtis. The two-term member of Congress has demonstrated an ability to reach across the aisle on issues from immigration to climate. Her challenger, Salt Lake County Mayor Ben McAdams, is a worthy rival, but it would be a mistake to take either of them away from the jobs they now hold. She’s only been in office a short time, but Rivera has built an admirable career in law enforcement and presents a compelling life story of someone who has accomplished much against great odds. After two terms, Gill may be reaching his sell-by date. But, for the second election in a row, rivals who claim they would be better at prosecuting crime don’t offer much in the way of specifics on how they would do a better job. The idea of boosting the state fuels tax by 10 cents a gallon in order to free up $700 million of general fund dollars for education strikes many, including its advocates, as a bit complicated. But passing this non-binding question will make it clear to the Legislature that not only do Utah’s schools need the money, but that Utah’s people are willing to cough it up. The Legislature has dithered entirely too long while people suffering from a range of maladies have had to choose between going without the help marijuana products can provide or violating the law. An alternative version that supposedly has the backing of various interests also has its merits. But, unless this measure passes, there is no reason to believe that anything will happen. This straightforward step to accept the expansion of the federal Medicaid program, without the need for any waivers or exceptions, is long overdue. The billions of dollars Utah taxpayers have given up and the illness and bankruptcy suffered by our friends and neighbors must end. Too often, the congressional and legislative districts drawn by members of the Legislature are blatant efforts to protect partisan, or personal, advantages. This proposition would create an independent commission to draw boundaries that are compact and centered on existing political boundaries and communities. This small tweak in the Utah Constitution would offer a property tax break to Utah residents who are called to serve out of state for 200 days or more in any 365-day period. It is well earned. This is being sold as a break to local governments and their taxpayers, when it would really be an unearned bonus for landlords. Constitutional Amendment C - Allowing the Legislature to call itself into special session: Hell, no. The Utah Legislature already has the unhappy habit of turning half-baked ideas into consequential legislation with little or no public notice or input. Allowing them to call themselves into session, rather than leave that power to the governor, would only make that worse. Correction: Oct. 29, 10:05 a.m. >> An earlier version of this editorial had the incorrect congressional district for Rep. Mia Love and Democratic challenger James Courage Singer.